Just a short piece I wrote for Uni...may as well blog it! With London Fashion Week coming to an end, that certain special biannually ‘buzz’ in the air has simmered down and life has gone back to normal in preparation for the spring/summer shows which will take place in September! During February this year between Friday 18th and Wednesday 23rd a total of 65 catwalk shows and 45 salon shows and presentations took place in London as part of London Fashion Week. From beautiful bright and colourful 60’s inspired Burberry coats to the adorable androgynous Dolce & Gabbana Teddy boy style suits; autumn/winter 2011-12 had it all! Regarding accessories, Mulberry showcased a to die for range of leather handbags in an array of colours whilst Giorgio Armani used extravagant bohemian style jewellery pieces to give his show that extra wow factor. 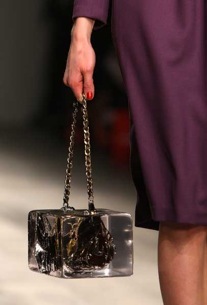 One accessory that particularly made an impact however was part of the PPQ show on the Friday. Founded in 1992, the young edgy fashion brand PPQ began its journey as an artistic partnership between Amy Molyneaux and Percy Parker. The trendy two didn’t push PPQ forward into a ready-to-wear brand however until eight years later in the year 2000. The label has stormed down the catwalk at every London Fashion Week ever since with its army of dedicated fans sat in the front row of each show. Influenced heavily by music, the designer duo produce season after season of fun and funky fashion and this February the partnership sent gothic glamour down the runway with a pallet of black, purple and grey. Models wore simple makeup; a subtle streak of black eyeliner to grace the eyelids and bright red glittering lips which stood out against the backdrop of pale skin and gave off a rather ‘vampish’ feel. Adding to the quirky Halloween theme running throughout the show was the chic ‘cat hats’ worn by the models – meow! To accompany the collection of short tailored dresses and Victorian ruffles was a selection of vintage style jewellery and accessories, this juxtaposed fiercely with the overall modern look making the collection more interesting as a whole. One of these accessories however looked more like a piece of art than something likely to be carried down a catwalk. Carried bravely, (it was a very heavy accessory), by a tall, slim model with blonde hair and blue eyes, was a deep purple vintage style handbag encased in Perspex. The handle poked through the top of the square casing allowing it to be carried easily. It looked beautiful from inside its tomb of resin, sparkling from within and complimenting the knee length royal purple dress it had been paired with. Now although not the most convenient accessory, being that you can’t even get in to the bag and open it, this item must not be disregarded as a piece of art nor a piece of fashion. PPQ have engulfed a beautiful object, one that helps to define fashion: the handbag, such a simple yet special and important accessory for women all over the world. They have preserved this marvellous piece of fashion history and culture forever like a delicate insect set in amber. Forget about fashion you can take to the streets, this spectacular artefact is one for the mantel; displaying fashion as an art, as part of English history. Fashion is so important to the British culture that maybe some pieces should be preserved like fossils, keeping style alive forever.